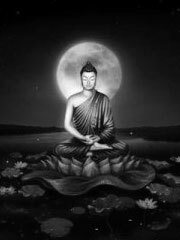 The Four Noble Truths (Pali, «cattari ariya saccani») are taught in Buddhism as the fundamental insight or enlightenment of Sakyamuni Buddha (the historical Buddha), which led to the formulation of the Buddhist philosophy. It is interpreted as the four Holy truths. In his first sermon at the Isipatana Deer Park, famous for the name of the Dhamma Cakkappavattana Sutta (Dhamma Wheel Screening Sermon), the Gotama Buddha has briefly taught the Four Sacred Truths (Cattari Ariya Saccani), which are the basic foundation of the Buddha Dhamma, the Four Truths. Dukkha: There is suffering in life for all beings. Samudaya: There is a cause of suffering, which is attachment and desire (tanha). Nirodha: There is a way out of suffering, which is to eliminate attachment and desire. Magga: There is a path that leads out of suffering, called the Noble Eightfold Path. This outline form is exactly that used by doctors of the Buddha‘s culture when diagnosing and prescribing for a disease: identify the disease, its cause, whether it is curable, and the prescribed cure. Thus the Buddha treats suffering as a «disease» we can confidently expect to cure. Because of its focus on suffering, Buddhism is often called pessimistic. But since Gautama Buddha presented a cure, Buddhists consider it neither pessimistic nor optimistic but realistic. The Four Noble Truths was the topic of the first sermon given by the Buddha after his enlightenment. He gave the sermon to the ascetics with whom he had practiced austerities.